Tell us about mother Marinda. I wept beside her grave when I finally found it. 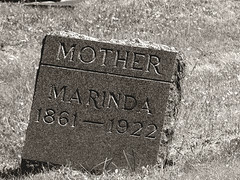 She was buried in the poorest cemetary in town, only 61. I remember her as a strong woman, both in body and spirit. My conviction broke her heart though. She never came to visit while I served my sentence. That I had disappointed her broke my heart. The jailers never even gave me the news she was dead. I vowed the day I got my freedom to forswear my evil ways, only to discover she had died two years earlier. She never even told me where she hid the loot. They came out at night, when the shadows of dusk faded and all that was left was a blackened stillness that, within minutes, became bloated with sound. The buzzing was incessant and maddening and continued until dawn broke each morning, when they stopped their hunt for flesh and blood. One night the creak of a door was heard among the buzzing. Marinda walked into the blackness and let them feed upon her, their beaks like hooks in her flesh, ripping her skin from her bones, dining and slurping until at last they were sated. And they were heard no more.